Yep... late again. I do promise one day I'll have the 5 Things for the week published when I should have it done (aka Monday). In the meantime... nothing I can do but keep going forward, right? 1) The cooler temps have been FANTASTIC!! I actually needed to put a jacket on this morning when I went to feed and the last 2 mornings driving in to work on the scooter have been downright nippy ("so say my nips"). Of course, we're supposed to be back to hot/humid for this weekend's horse show. But the glimpse of fall was nice, especially for the end of August. 2) Yes, I'm showing again! Had a wonderful ride last week (and hopefully again tonight) on Jen Shimp's Spot and I'm going to be showing him this weekend at the DLSC hunter show at Greenstone Stables. If you're in the neigh-borhood (pun intended) stop by. No guaranteed ride time as it's a hunter show but probably afternoon. 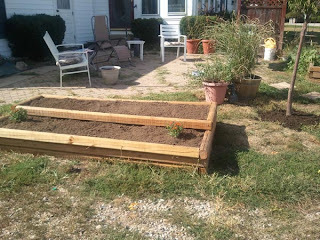 3) Managed to get some work done on the patio this weekend. Finished the 2nd raised bed, cleaned up the grass (aka weeds) around it, put down the paving stones, and cleaned up the flower pots and planted a couple new plants. Now if the grass (weeds) coming up between the patio stones would go away it would look nice. 4) Went to the Little Art Theater in Yellow Springs on Friday and saw the movie "Buck". VERY well done and I recommend it to anyone. Really doesn't matter if you're really into horses and horse training. Buck Brannaman has some quality life nuggets he shares. Interesting guy and a great outlook on life. It's running at Little Art through Thursday, September 1st. 5) Still have half the turkeys not spoken for. If you want a farm-raised turkey for the holidays (will be butchered for you), speak up! 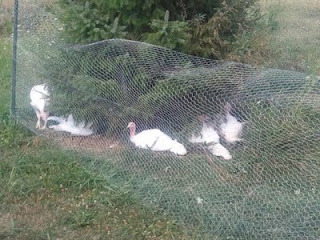 Turkeys lounging in the afternoon under the shade of the pine tree inside their run. I’m stealing this idea from a friend of mine. He’s been writing “5 Things I think” on Mondays in his blog, http://dangerousleanings.blogspot.com/ , for a while now. I like the idea, although I think a generic “5 Things” is enough. No sense in putting pressure on anyone to actually think on a Monday. Plus it will help me remember to post at least weekly, even when things are busy on the farm. Thank you Dangerboy for the great idea. Hope you don’t mind me stealing it. And yes, I know this first installment is a day late. Untreated, cheapo plywood drinks paint like it was an alcoholic at an open bar. Trying to finish painting all the wood surfaces on the new Turkey tractor has been a chore and taken over 2 gallons of paint! The exterior of the door and half of the back panel still need painted. The turkey tractor, like most “home improvement” projects, is costing more in terms of time and money than originally predicted. It seems projects have a way of doing that. I hope it’s not just me – that wouldn’t help specifically, but certainly make me feel better. One more thought about the turkeys – half of them are spoken for! I’m thrilled with this development. I have 6 definite email yes’s and one deposit paid (as well as one or 2 “I think so”s). It’s been an interesting year with them and I’m looking forward to how they finish out as they’ll soon be out on grass during the day (still need to get the fencing installed for their run). I definitely think I’ll be doing turkeys again next year, hopefully at least some heritage breeds like Bourbon Reds or Royal Palms. It will be interesting to see the differences. On days like today I could definitely picture myself doing farming full time, in one capacity or another. It’s downright gorgeous outside and I’ve been way too busy inside (at work)! And finally… something I do think: I think this really is going to be a good and fun way to update the farm blog. The new coop is almost ready for its first residents - 13 almost 8-week old turkeys! I can't believe how much they're growing. I was in Michigan announcing at Hunter's Run Horse Trials this past weekend and came home and I swear they grew! Hopefully by the weekend they'll be in the new coop and the run will be up so they can get their first taste of grass... and bugs... and scratching in the dirt... and sunlight... and all the good things that turkeys should get to experience. I've started sending out notices to those who have mentioned it in the past... but it's time to start solidifying buyers for the turkeys. I'm asking for a $20 deposit per turkey. The deposit will be applied towards the final cost of your bird. Yes, unless otherwise arranged individually, all turkeys will be prepared for pick up (butchered, defeathered, cleaned, etc.). Final cost will depend on weight at $3 per pound. Keep in mind these are the commercial Broad Breasted White variety turkeys (next year I hope to have at least some heritage breed turkeys like the Bourbon Reds or Royal Palms). It's also my first year raising them. 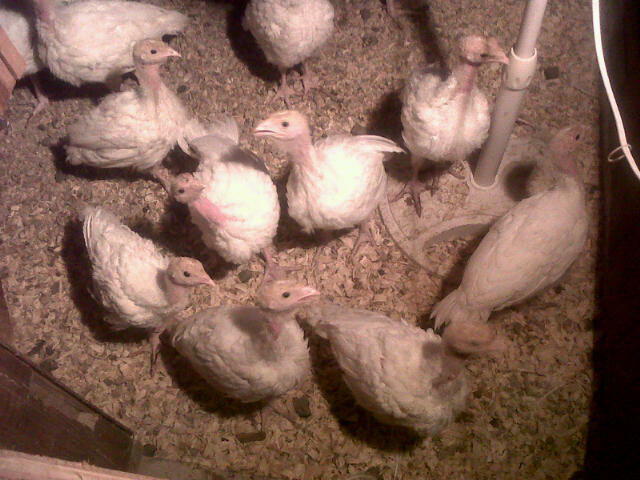 This variety of turkey has been specifically bred to thrive on being in cages with large quantities of commercial feed to grow to a large size. I'm a firm believer that any animal raised for food should be raised so that they get to BE whatever they are. For the turkeys that means allowing them to BE turkeys -- eating grass and bugs out in the sunshine! That said, they will be given commercial feeds as well. As much as I believe they need to be natural, this variety in particular has been bred to have the higher proteins in the commercial feeds and I find it just as irresponsible to NOT allow them that as well as the grass and bugs. With all that in mind, the probability exists that these turkeys will not reach their "full potential size" simply because I'm raising them differently. If you are interested in buying a turkey for the holidays, please let me know as soon as possible. We can arrange the receipt of the deposit at that time. Your name will go on the buyers list for a turkey. If something should happen to "your" turkey, where no substitute is available, you will receive a full refund of your deposit. Any cancellation by you of your turkey order, prior to November 10th, you will receive 50% of the deposit in refund. Cancellation after November 10th, results in forfeiting the entire deposit. Just a few recent pictures (taken with my icky camera phone - my apologies for the quality). Turkey peepers wondering where their dinner is. Moonlight... after the "big escape" sitting under an apple tree near the pasture. Stewie staring at me. Evidently I interrupted him using the tree as a scratching post. 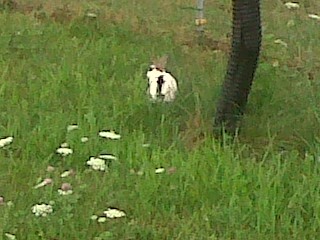 The heat has been oppressive here at the farm. Quite honestly, the heat has been an excuse not to get some things worked on. Silly perhaps, but it's true. After a days work, coming home and sitting in the comfort of the semi-air conditioned house is a whole lot more appealing than working outside and sweating. The animals seem to be coping well. Stewie (the beef cow) has been spending a lot of time in the barn, either in his area laying on the dirt or in with the chickens on their deep bedding. I think the only thing that really bugs him is... well... the bugs. The horseflies have been awful this year. 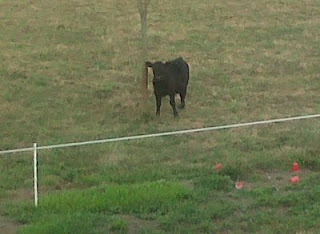 Doesn't stop him from grazing the pasture when he feels like it though. Charlie and Moon have a literal jungle in their kennel. The grass has grown up to 3' in some places and I think they love the shade. They're also digging. I'm sure it's cooler underground so I've been a little lax in filling in all their holes. That is until I walked out of the house the other day and found Moon in the driveway. She'd dug her way out of the kennel... and when I walked towards her she slowly scurried back into the tunnel and back into her kennel. That hole got filled in. Moved the peepers into the attached garage. The brooder house has a very low ceiling and even taking out one of the windows (covered with wire) and runnign 2 fans it was getting way too warm in there. The attached garage area is smaller, but it has a higher ceiling and while warm isn't as hot. Decided that the turkey peeps need their own coop so I'm in the process of building that now. Designed it based on an online friend's coop that was featured in the video attached to this story about her and her heritage breed turkeys -- Pick Your Poults Way Before Thanksgiving Day. Hopefully I'll have a full set of pictures on how it comes. Trying to get a new camera to work has been "interesting" so far. The peepers are a month old now and just about ready to be turned out in the world... so I've been trying to get this setup done. May end up doing PVC and a tarp for the roof instead of making it a permanent roof this year. We'll see. Egg production has finally dipped due to the prolonged heat. Yesterday was the slowest day yet -- only 9 eggs -- but collection has been down to a dozen/day for about a week now. Hopefully the heat will stop soon! Have started to contact banks in anticipation of picking up a few more acres. Also still have a list of projects that need to be completed. Nothing is ever static on the farm -- even when all you want to do is sit in the air conditioning.